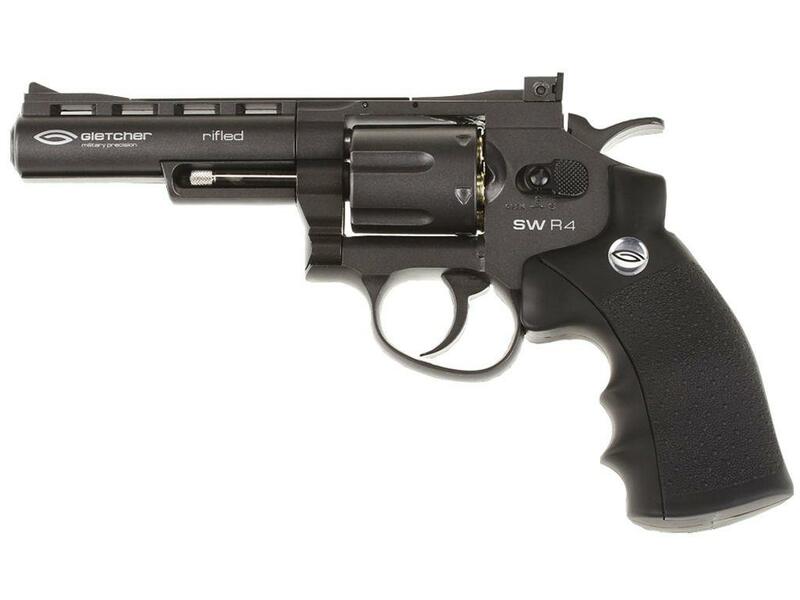 Gletcher SWR4 Full Metal CO2 Pellet Revolver | ReplicaAirguns.ca | Easter Weekend Sale! Accuracy: Shooting the Gletcher SW R25 CO2 Pellet Pistol at a target from 30 feet at a semi-rested position results in a 1 to 1.5 inch grouping just to the top left of the target. 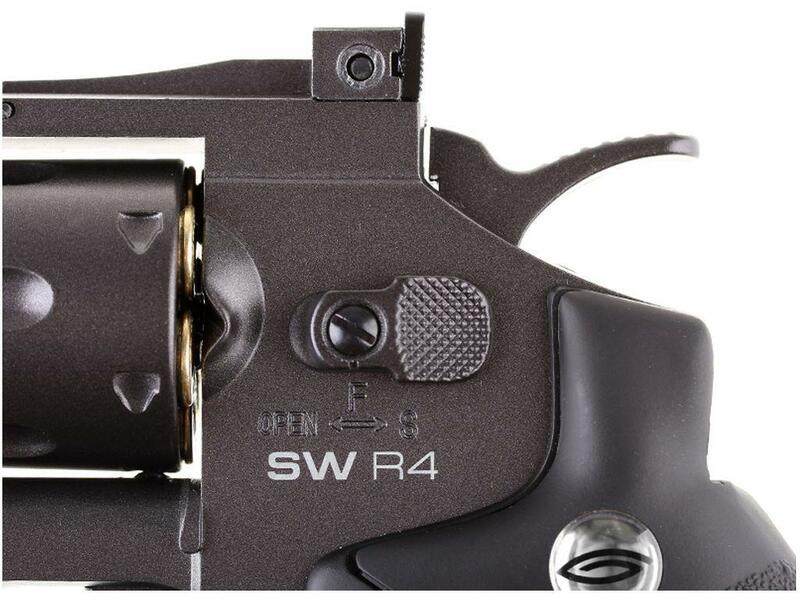 The sights are adjustable for elevation and windage. Velocity wise, the Gletcher SW R25 CO2 Pellet Revolver shot pretty hard considering I was using 7 grain lead pellets (as compared to 5.1 grain steel BB's) and this was the shortest barreled version at 2.5 inches. 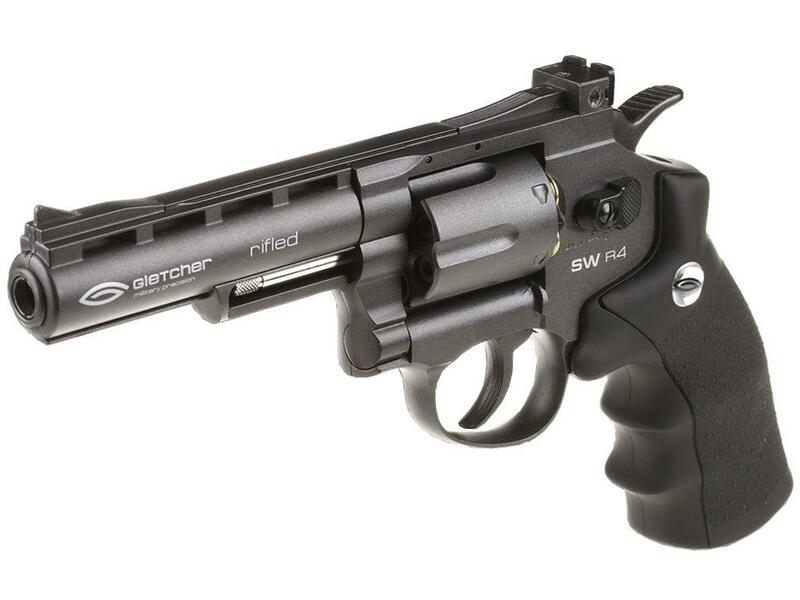 The Gletcher SW R25 averaged a 337 fps 6 shot velocity with its highest fps shot of 351. I then stepped back 30 feet and shot at a paper target, the Gletcher SW R25 CO2 Shell Loading Pellet Revolver produced a nice tight 6 shot grouping that was really close to 1 inches in diameter. Considering how short the barrel is and how close together the front and back sight are to each other, this is not a bad result at all. I am sure the rifled barrel helped a lot here. I did shoot a bit high and to the left but this can easily be corrected by adjusting the rear sight for windage and elevation. 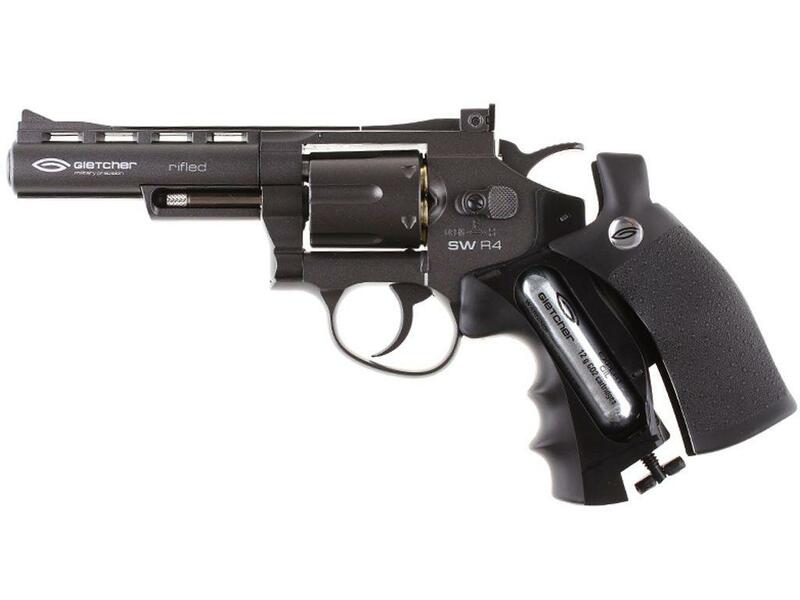 Overall, the Gletcher SW R25 CO2 Pellet Revolver shot pretty hard and with good accuracy for a shell loading pellet revolver. 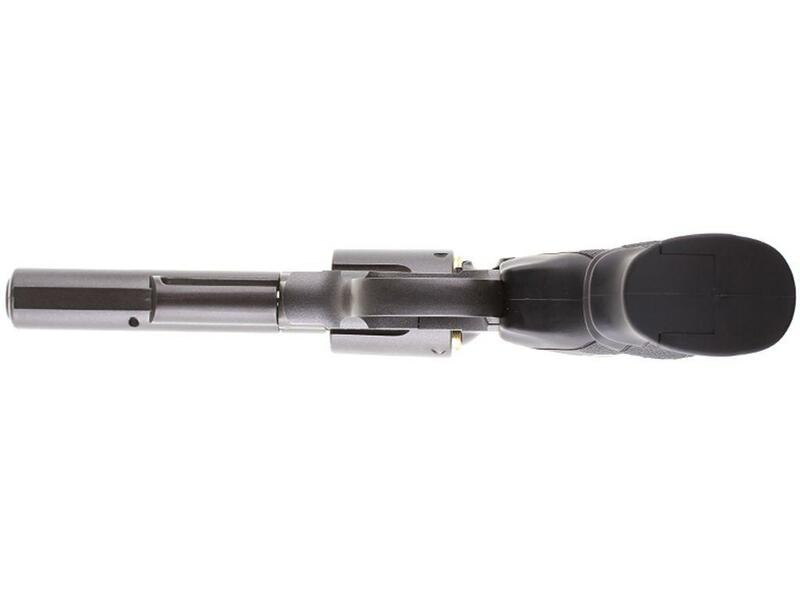 It will be interesting to see how well the 8 inch version of this Gletcher Shell Loading Pellet Revolver does when I test it out shortly? This is my Official Field Test Shooting Review video for the Gletcher SW R25 CO2 Shell Loading Pellet Revolver. At this time we are out of stock, I am not sure exactly when we are going to have them back in stock. In this Field Test Shooting video I test out the performance of the Gletcher SW R25 using my Chronograph to get an actual Feet Per Second velocity rating, I also shot 6 rounds at a paper target setup 30 feet away using a semi-rested position (Sand bag up front and standing in the back). Velocity wise, the Gletcher SW R25 CO2 Pellet Revolver shot pretty hard considering I was using 7 grain lead pellets (as compared to 5.1 grain steel BB's) and this was the shortest barreled version at 2.5 inches. 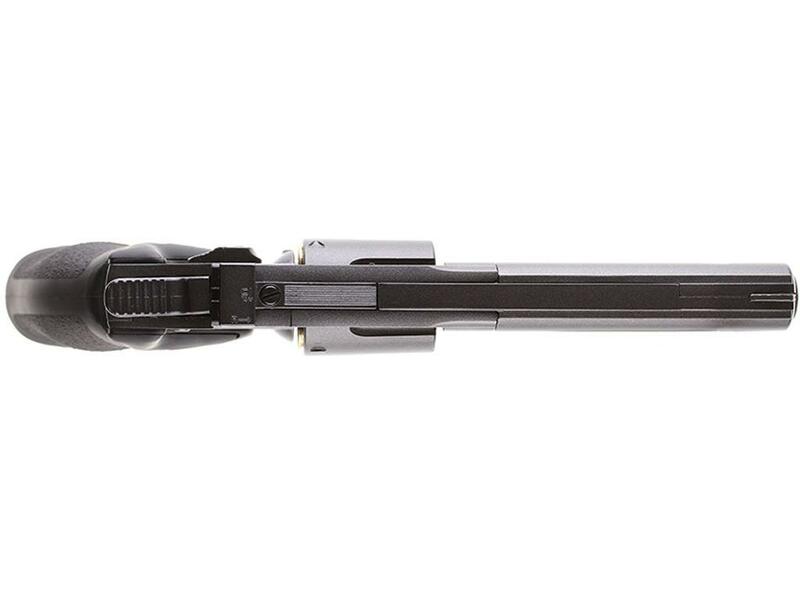 The Gletcher SW R25 averaged a 337 fps 6 shot velocity with its highest fps shot of 351.